Were you looking for Alere INRatio2 PT INR Professional Test Strips Recalled Due to Patient Deaths or Anti-Coagulation Medication or Coumadin (Warfarin - side effects) lawsuits? The Alere INRatio Monitoring System is a handheld device used by patients to monitor amounts of the blood-thinning drug Warfarin. While these drugs prevent blood clots, too little or too much can be life-threatening—accurate monitoring is crucial, especially if the patient is self-monitoring their blood levels at home. The INRatio2 system was recalled by Alere, the manufacturer, in 2014, after reports that patients could receive inaccurate results, particularly in patients who are on Coumadin or Jantoven. In July 2016, the FDA announced the Alere INRatio device will be discontinued. Send your Alere INRatio Recall claim to a lawyer who will review your claim at NO COST or obligation. Alere INRatio and INRatio 2 PT/INR Monitor Systems measure the speed at which a patient's blood clots when taking Warfarin (brand names Coumadin and Jantoven). The system uses an International Normalized Ratio (INR) test to compare the results of the patient's blood clotting. The test is conducted by healthcare professionals and trained patients/patient caregivers and is used to determine appropriate levels of warfarin to lessen the risk of a patient experiencing a fatal bleeding event. Patients who were using the INRatio and INRatio 2 PT/INR Monitor Systems were receiving test results that differed from those they received from blood tests performed by their doctor or laboratory. In May 2014, Alere Inc. initiated a voluntary Class 1 recall to its INRatio and INRatio 2 PT/INR Monitor System, and announced in December 2014 that patients with certain medical conditions should not be tested with the system. Alere had received complaints from patients on Warfarin whose at-home test results differed from those performed by a laboratory. Specifically, a number of patients had a therapeutic or near therapeutic INR with the Alere INRatio2 PT/INR Professional Test Strip but a significantly higher INR (outside of therapeutic range) when performed by a central laboratory. In May 2014, Alere reported nine serious adverse event reports, three of which described bleeding associated with patient deaths. 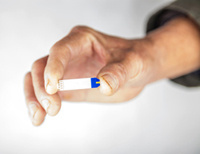 Alere warned in its recall that the INRatio system could provide inaccurate results, i.e., that the AlereINRatio2 PT/INR Professional Test Strips may report an inaccurately low INR result. Further, patients with certain medical conditions, including anemia, elevated fibrinogen levels or unusual bleeding could result in lower INR results than expected. Inaccurate results could cause doctors not to make necessary changes to a patient's warfarin dosage, putting that patient at risk of a bleeding event. Shortly after Alere’s May recall theFDA explained in its safety warning significantly different test results between the Alere INRatio2 PT/INR Professional Test Strip and the local laboratory plasma INR test. According to the FDA, Alere received almost 19,000 reports of “incidents” from 2013 through 2014 about the INRatio Test Strips, although not all of those complaints were linked to the recall. The Alere device was approved for home use in 2002. Problems regarding inaccurately low readings were reported as early as 2005, when the FDA issued warnings to Alere for failing to act on complaints about erroneous results. But the INRatio Test Strips weren’t recalled until almost a decade after those first complaints. As of March, 2016 InRatio had been linked to more than 1,451 injury reports, according to The New York Times. Earlier this year, FDA investigators concluded that the faulty devices had a “minimal” impact. False readings were also linked to 18 deaths in 2014 and 2015. In July 2016 the agency announced that Alere initiated a voluntary withdrawal of the Alere INRatio and INRatio2 PT/INR Monitor System. Warfarin-Alere Lawsuit Now that the blood-testing device is known to cause inaccuracies, attorneys are beginning to focus on Warfarin-related injuries. And there may be legal action against Alere. Xarelto and Warfarin As well, an investigation regarding use of Alere that was used in the new blood-thinner Xareltoclinical trials, may have resulted in false data. As a result, Xarelto may have been shown to be more effective than it really was, and more effective than Warfarin. The INRatio Monitors were used in the clinical trial comparing Warfarin to Xarelto. Critics say false readings may have skewed results against Warfarin. Data from the Xarelto clinical trial was also sent to reputable medical journals, according to the New York Times (May 2016). Lawyers for Xarelto plaintiffs claim that the esteemed New England Journal of Medicine left out critical data in the drug’s analysis. The Xarelto trial was led by Dr. Robert M. Califf, now head of the FDA. On its website Alere says it has “helped over 10,000 physicians provide Home INR Monitoring services to manage over 50 million test results from over 75,000 patients". Alere INRatio Plaintiffs Petition Court to Ke.. Adverse Events for Patients Using Alere INRat..
Alere Inc. In Tough over Recalled INRatio, Ab.. I have used Alere machines for few years until the last recall. There was some doubt several times about the accuracy of the machines, but I have not suffered any serious injury from using Alere blood monitor.